It’s a funny thing, is rosewater. Too much of it in a dish and each bite is like a group hug with a gaggle of perfumed grannies. Although, get the balance right and you are greeted with a sensation that is more a scent than a flavour. 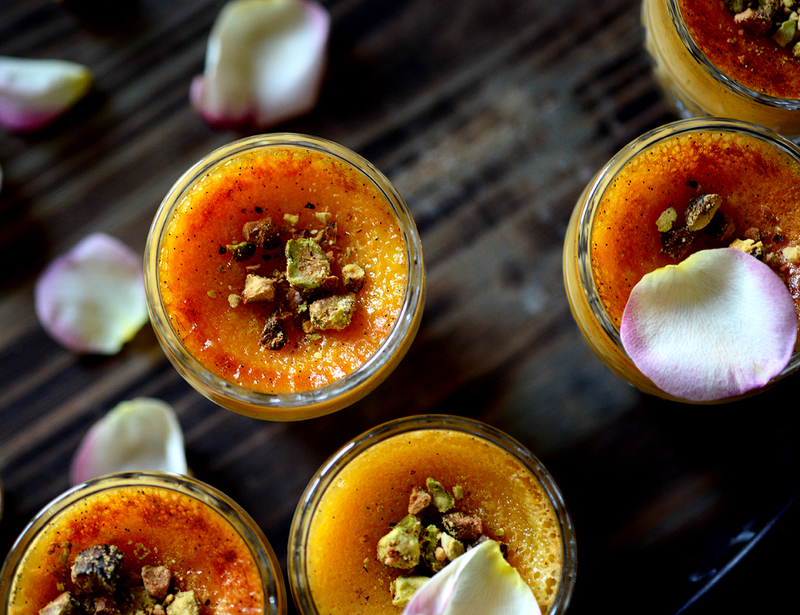 A nuance that adds a romantic and intoxifying quality to the dish, whether it be a scented middle eastern fried rice, a soft and yielding Turkish delight or the Indian Gulab Jamun. In India, rose is a default flavour, much like chocolate or strawberry in Australia. 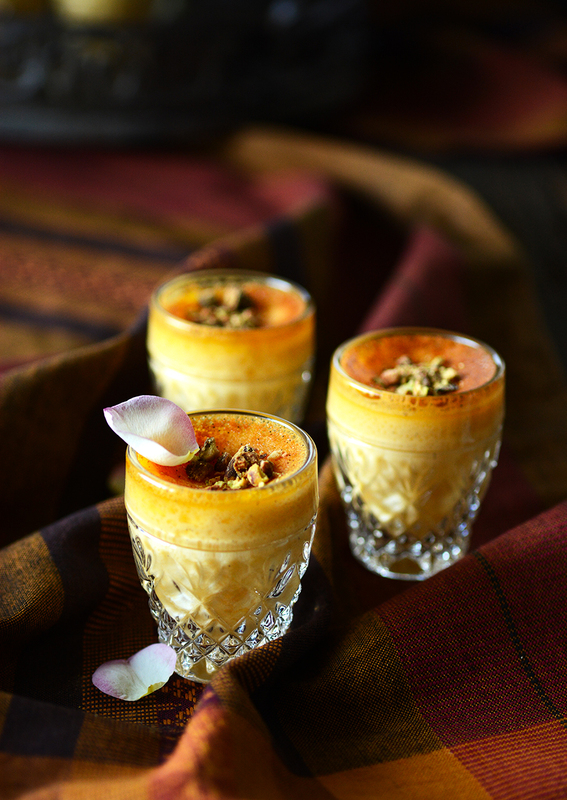 Growing up, rose milk, rose Kulfi and the Gulkand (rose jam) that my mum used to buy me from tiny footpath stalls in Bangalore were well-loved and anything but exotic. We Indians have the middle-east to thank for rosewater, which was obtained by chemists in the ancient Islamic world using a steam distillation method. We now not only use it in our cooking, but also in Ayurvedic medicine and as a perfume. It is not uncommon for unsuspecting wedding guests to be sprinkled with a liberal amount of it upon their entry to the venue as a welcoming gesture. 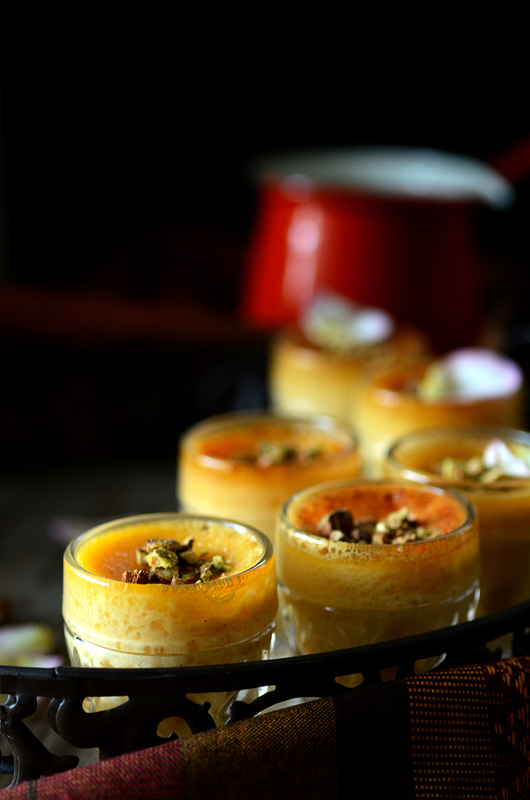 When a friend gifted me a copy of the beautiful Delicious Home Cooking by Valli Little, I immediately zeroed in on the recipe for Honey Pots De Crème, the cogs in my mind turning as I worked out how I could make it a fructose-free version with Indian flavours. 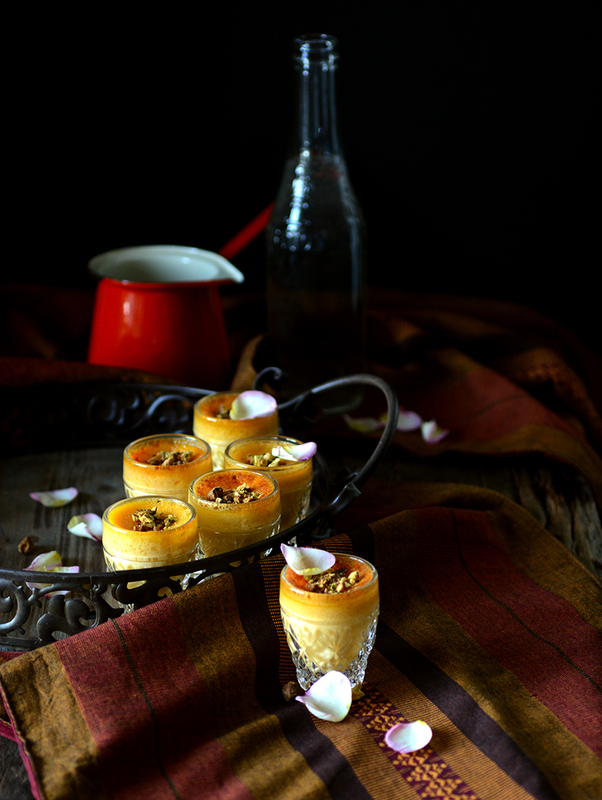 The result was a smooth baked custard wafting with the fragrance of roses and saffron, which lends itself to a biscuit for dipping or a sprinkling of nuts as it pleases you. In a medium-sized saucepan, warm the cream, milk, rosewater, saffron and syrup or honey until just simmering (but not boiling!). Stir gently to incorporate the syrup/honey. Take off the heat and allow to cool a little. Split the vanilla bean and scrape the seeds into a mixing bowl. Put the bean casing into the cream mixture. To the bowl with the vanilla seeds, add the egg and egg yolks. With an electric beater, beat until pale and a little thickened. Add the egg mixture to the cream mixture and stir until well combined (do not beat or you will create more froth). Set aside off the heat for 5 mins to infuse. In the meantime, boil a kettle of water. Place the ramekins (3 or 4) or shot glasses for smaller portions (8) in a deep ceramic baking dish. You can also use small glass jars. Strain the mixture into a jug and divide the mixture between the ramekins or shot glasses. Set the dish with the ramekins on the middle shelf of the oven and carefully pour boiling water into the dish to a level about half of 3/4 of the way up the sides of the ramekins. Bake for 40-45 mins or until set but with a slight wobble. Remove the dish from the oven and carefully lift the ramekins out of the hot water and onto a tray. Allow to cool completely, then chill in the fridge for at least an hour before serving. I roasted the pistachios for about 6-7 mins, then crushed them and sprinkled them over the Pots de Crème before serving. You could use anything that provides a bit of a crunch like other nuts, wafers or honeycomb. *Rosewater is available at Indian and Middle eastern grocers. Hello. I just came across this great page exactly one yr after it was published. I hope Deepa-ji is still taking questions! If so, can you please tell me if there’s a way for me to make this without eggs? I know it’s a custard & so is probably impossible, but I can’t have eggs & am obsessed with these flavours from both my parent’s homeland (Lebanon) and places like Chozha Nadu. If not can you suggest an alternative? I’m still learning my way round the kitchen and don’t have much self esteem in there yet. Hi Ludovic! Thanks for the question. ….it’s a good one! I must say I have never tried it without egg. Do you get a vegan egg replacement? Also I hear the water from tinned chick peas is a decent egg replacement in baked goods. ..bizarre I know! I will let you know if I get a chance to try it and please do the same. These look and sound seriously delicious! Can’t wait to try this recipe out. Thanks Habiba! Do let me know if you try it! How gorgeous! You’re right in having to be ‘just right’ with rose water. I found it overpowering many years ago but now I think most chefs are understanding the balance needed and as such, I really enjoy the fragrance and taste. 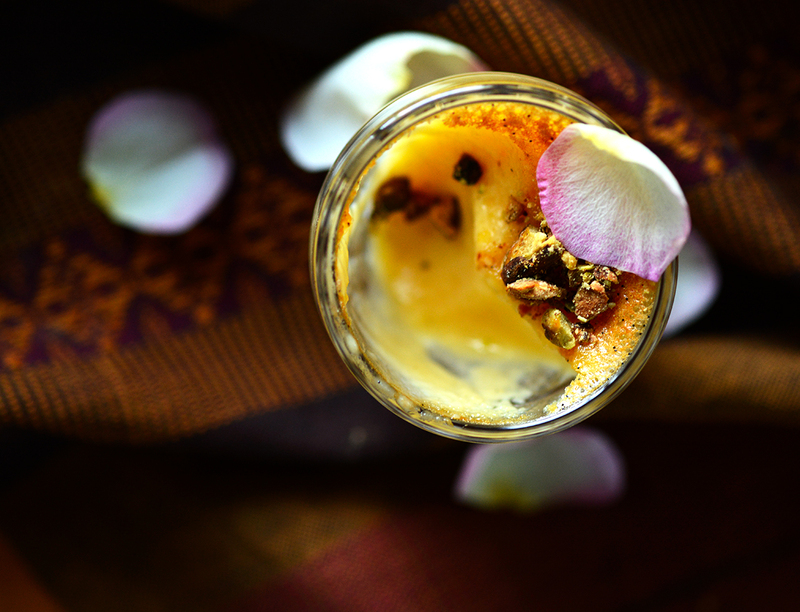 Our local Indian eatery does a diving rose water and saffron lassi but your pots de creme would be amazingly decadent! Thanks so much. The Lassi sounds like it would go down a treat, especially on a hot day! The honey was in the ingredients but not in the method. Ruined all my custards! Oh no I’m so sorry! I have just fixed it up. Thanks for letting me know and sorry about your custards! Picture perfect…adorable glasses. Thanks for the recipe. You’re welcome, I hope you enjoy it. And thank you for the lovely words. Wow Deepa, These look amazing! I love the rose and saffron combination. Hi Peter! Thanks so much, it’s lovely to be featured in others’ blogs.